What a nice way to spend an afternoon! We will meet at Dunkin’ Donuts, located at 22722 State Rd 54 (just West of Collier Pkwy), at 9:00am. We will leave at 9:30am and cruise to Streetside Classics for a tour of their facility. Then we will cruise to Ford’s Garage for an 11:30am lunch (for those that might want to meet us there). 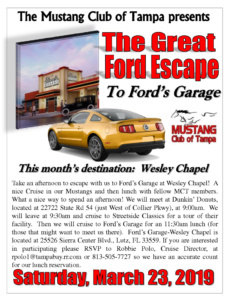 Ford’s Garage-Wesley Chapel is located at 25526 Sierra Center Blvd., Lutz, FL 33559. If you are interested in participating please RSVP to Robbie Polo, Cruise Director, at rpolo1@tampabay.rr.com or 813-505-7727 so we have an accurate count for our lunch reservation.